Hino Ranger PRO 8Z, four-wheel drive, diesel engine-powered crew cab chassis with seating for five crew and a integrated Deck Access Hatch to allow crew to move between the cabin and the crew deck without debussing from the vehicle. 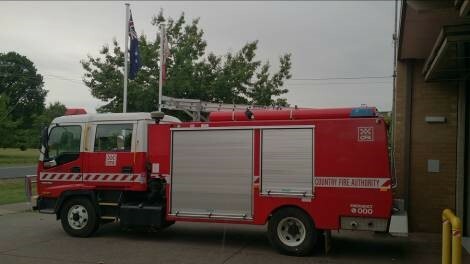 The truck has a water tank size of 3,750 litres with 750 litres reserved for the CFA Crew Protection System. The system incorporates the vehicle spray system with drop down fire curtains in the cabin for operator safety. The spray system has 31 spray outlets distributed evenly over the vehicle. Water Capacity: 3750 litres, 3000 litres useable and 750 litres for crew protection through the spray system. Pump controls triplicated (cabin, crew deck and rear). Equipment: 2 x breathing apparatus, chemical splash suits, chainsaw, Automated External Defibrillator, 40 litres of A class foam for class A type fires and 5.4m ladder. Hino FT1J 1022 four-wheel drive diesel engine powered crew cab chassis with provision for seating five crew and a integrated Deck Access Hatch to allow crew to move between the cabin and the crew deck without debussing from the vehicle. 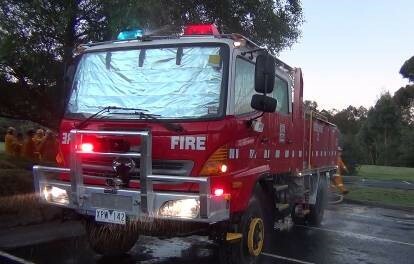 The truck has a water tank size of 2000 litres with 500 litres reserved for the CFA Crew Protection System. The system incorporates the vehicle spray system with drop down fire curtains in the cabin for operator safety. The spray system has spray outlets distributed evenly over the vehicle. Water Capacity: 2000 litres, 1500 litres useable and 500 litres for crew protection through the spray system. Pump controls triplicated (cabin, crew deck and rear). Fire fighting pump set comprising a Lombardini air-cooled diesel engine which is close-coupled to a GAAM Mk 250 two stage centrifugal fire fighting pump with a capacity of 450L/min @ 700kPa. Equipment: 2 x breathing apparatus, chemical splash suits, chainsaw, Automated External Defibrillator, 40 litres of A class foam for class A type fires, 5.2m ladder and a bull bar mounted monitor. This truck was purchased and outfitted using your donations, and is owned by the brigade. Isuzu FRR 500, two-wheel drive, diesel engine-powered crew cab chassis with seating for up to six crew. The truck has a water tank size of 1,200 litres, Class A foam tank of 100 litres and a Class B foam tank of 100 litres. The rear mounted PTO driven Waterous CZ centrifugal pump set has a maximum output of 3,000 litres/min @ 700 kPa. All pumping operations are controlled from the instrument panel located at the rear of the appliance. Pump capacity: 3000L/min @ 700kPa. Carries 2 x breathing apparatus, chemical splash suits, Automated External Defibrillator, 100 litres of A class foam, 100 litres of B class foam, 5 m ladder, 9 m ladder, positive pressure ventilation fan, quick cut saw and thermal imaging camera. Toyota Hilux 4×4 diesel engine powered crew cab chassis fitted with modular body to carry portable fire pump set, scene lighting unit and LP gas flare off response kit. The FCV is utilised for fire-ground intelligence gathering, command and control. This vehicle was purchased by the brigade, using your donations, and is due for replacement. Alternative vehicles are expensive and the accessories needed to bring it up to the standard demanded of a fire vehicle add to the cost. Are you able to help us with a donation to the brigade towards the cost? You can donate using our paypal facility found on these pages or by approaching any member of the brigade for assistance. Slow down when you see red and blue!